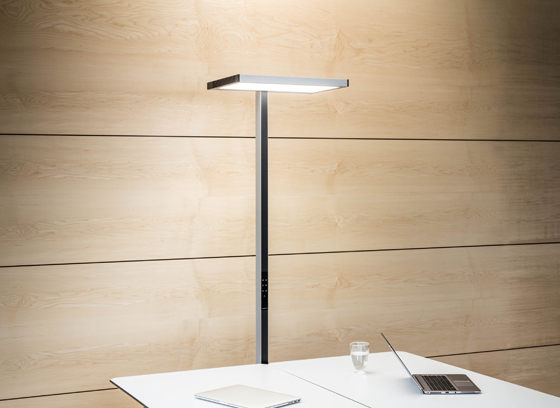 Renowned for introducing state-of-the-art LED technology to offices and homes, German lighting brand LUCTRA has significantly upped the ante with its latest design – its new floor lamp, VITAWORK. 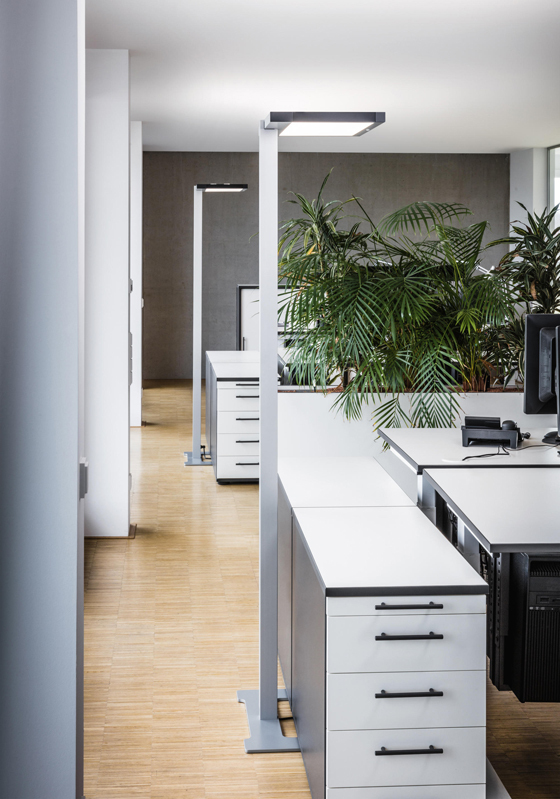 LUCTRA, which was founded by parent company DURABLE Hunke & Jochheim GmbH & Co KG in 2015, presents VITAWORK at this year's Orgatec, the biennial Cologne fair for the modern working world. 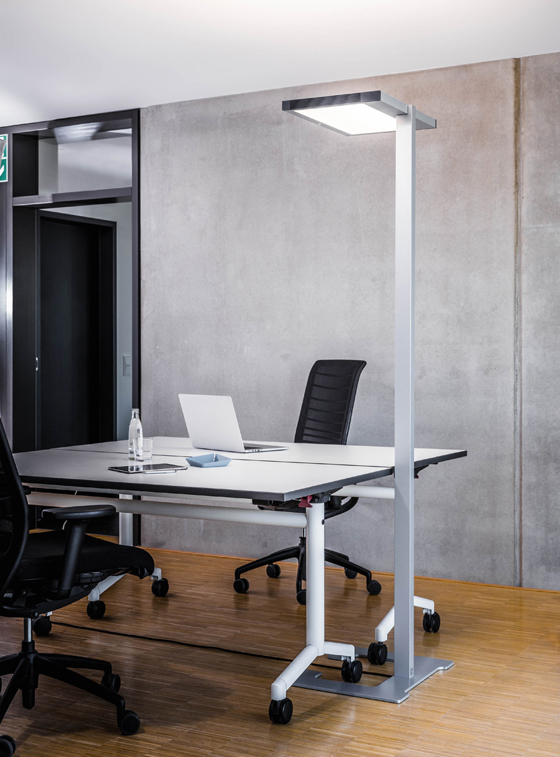 Available in silver or black, VITAWORK augments and complements LUCTRA’s existing range of floor, table and portable lamps, the key difference being that VITAWORK can illuminate larger areas. 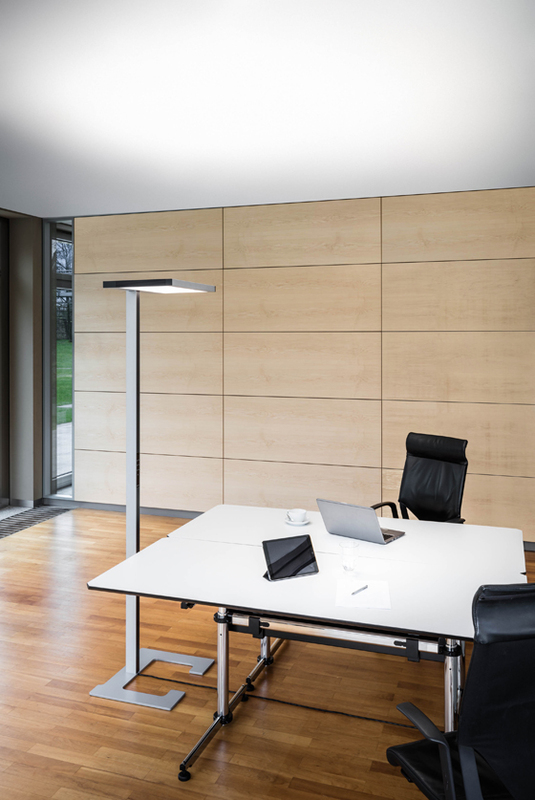 The rectangular lamp head projecting from its elegantly pared-down, slender base can light up an entire office either with direct and indirect light. VITAWORK’s simplicity is perhaps deceptive: in fact, it’s a highly considered design that unites functionality, energy-efficiency and streamlined good looks. It’s no accident that its appearance is understated and unobtrusive. 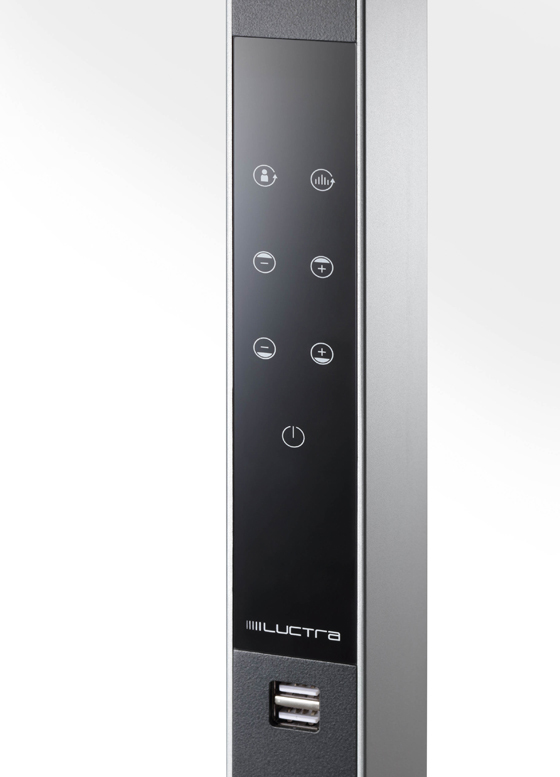 Its clean lines simultaneously fulfil aesthetic and practical needs. Stripped of superfluous elements, its main focus is on the quality of light it sheds. Moreover, its neutral form allows it to blend well with any style of office interior. Equally sleek and clean-lined is the lamp’s flush-mounted, touch-sensitive operating panel with a discreet plastic surface, which is activated intuitively. 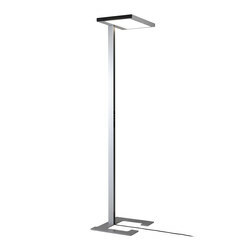 The panel can be positioned at a different height when a lamp is ordered, making it suitable for different table heights. 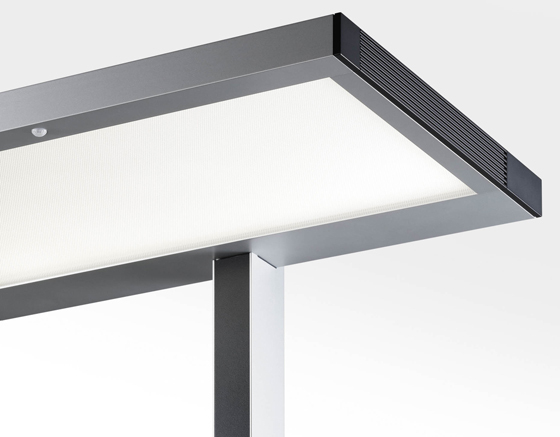 The lamp’s intensity can also be adjusted thanks to sensors that respond to people’s movements around it. These allow the light inside a room to counterbalance the changes in natural daylight outside in order to keep lighting levels indoors consistent. As the light outdoors darkens, VITAWORK’s light brightens; conversely, when a room fills with strong daylight, the lamp becomes dimmer. The lamp can also be manually dimmed. Another crucial feature of VITAWORK is that it’s available in three levels of light intensity – 7,000, 12,000 or 17,000 lumens – and so provides light suitable for rooms of varying sizes. In terms of its functionality, this structurally sound lamp’s centre of gravity is near the top of the mast, ensuring the design is perfectly stable. 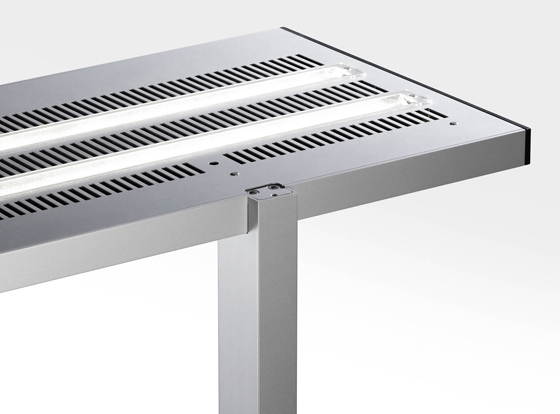 VITAWORK can stand right next to desks and tables, allowing the shade projecting from its mast to illuminate surfaces under it efficiently and evenly. VITAWORK also fosters sustainability as all of its materials are recyclable. What’s more, it reflects LUCTRA’s belief that good lighting promotes wellbeing and happiness, reduces fatigue and boosts productivity. VITAWORK fulfils the requirements of the DIN EN 1246-1 standard, which satisfies people’s need for visual comfort in the workplace. In line with the latest scientific research into the benefits of lighting, LUCTRA adheres to the principle of Human Centric Lighting (HCL), which optimises good health and efficient working by providing people with lighting suited to their needs. LUCTRA’s lighting also boosts wellbeing by simulating natural daylight. Another appealing feature of VITAWORK is that there’s no need to stick to the standard version, attractive though this is: it can be customised in limitless ways. For example, the colours of its various components, be its shade or cable, can be matched to a business’s corporate colours. Other elements can be tailor-made to meet specific requirements — the length of the cable or lamp base’s height can be altered according to individual needs. USB ports can also be integrated into the lamp as required by the user. Depending on the particular model of VITAWORK, it is priced between €1,450 and €1,925. Finally, VITAWORK’s high design goes hand in hand with superb quality. Like every LUCTRA product, VITAWORK is hand-assembled by its expert staff at its factory in Kamen in western Germany, then subjected to rigorous quality control. The Italian premium manufacturer B&B ITALIA teamed up with design heavyweight Piero Lissoni for the new SAKé sofa collection.